MPs amended the 2016 national budget. The Verkhovna Rada adopted on 5 October a bill on amendments to the national budget for 2016, which, inter alia, suggests increasing defenses and security spending by to 7.1bn hryvnia. The bill was supported by 298 deputies. The Ministry of Defense will obtain 3.8bn hryvnia, 175hm hryvnia - General Directorate of Intelligence the Ministry of Defense, 2bn hryvnia was allocated to the National Police, 963, 5m hryvnia - the State Border Service, 128.5m hryvnia - the Security Service of Ukraine, 51m hryvnia - State Department of Security, 50m hryvnia – will go to the State Service for Emergency Situations, and the 5.4m hryvnia was given to the State Special Transport Service. In addition to extra budgets to uniformed ministries, the draft law provides for 1.5bn hryvnia in an in officials's salaries in accordance with a norm of the new law on civil service. The Ministry of Utilities will obtain through the Regional Development Fund 950m hryvnia earmarked for the financing of investment programs and regional development projects. A sum of 420m hryvnia are aimed to increase support for coal mining enterprises. The Ministry of Justice is to get 90m hryvnia to finance the costs associated with the representation of the interests of Ukraine in foreign jurisdictions. The parliament gave 50m hryvnia for the modernization and technical modernisation of vocational schools. The explanatory note to the bill says the increase in budget expenditures is proposed to be financed from 6.1bn hryvnia that have been saved during the payment on government bonds, 2.4bn hryvnia - in servicing the debt, and 0.4bn hryvnia - at the expense of other low priority spendings. In addition, the increase in budget expenditure is proposed will be covered from 1.16bn hryvnia earmarked for in local budgets in the occupied part of Donbass. The current edition of the national 2016 budget envisages 55.6bn hryvnia in defence expenditures, the Main Intelligence Directorate - 1.1bn, the National Police - 14.8bn hryvnia, the State Border Service of Ukraine - 5.5bn, the Security Service - 5, 5bn, and State Protection Directorate - 602m hryvnia. 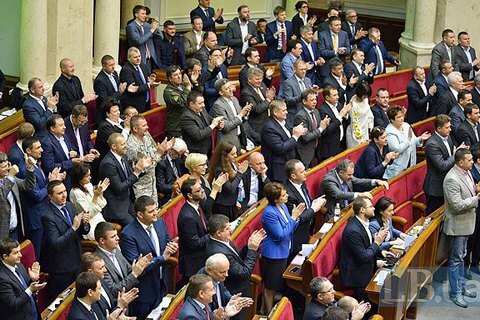 Cabinet asks Rada to amend "Savchenko law"